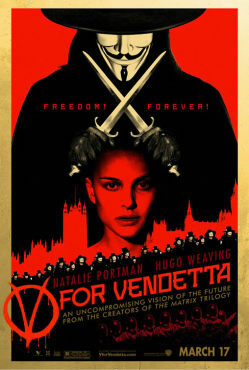 I finally watched "V for Vendetta " (yes, I know I'm a little behind the curve on this one). In the movie, virtuous, verbose (and often violent) hero/anti-hero V tells his reluctant protege Evey that the only way she will have true power over their oppressive government is when she no longer fears their ability to take from her. When she no longer fears pain, loss and even death, she becomes unstoppable. Now it's no surprise that fear of failure and rejection motivate many an entrepreneur, but I recently was able to get my mind around a new fear that I think plagues and ultimately squelches the untapped creativity and confidence of millions of innovators. I call it "Fear of the Missed Big Break" and I know it because I lived it firsthand during the 05 Staples Invention Quest , and I've seen it since among friends. It goes like this: An innovator has a great idea for a product or service or business. They find a potentially receptive audience for that product or service or business, whether through a competition like Invention Quest, American Inventor, or through more traditional business means like a sales pitch. Then the fear starts to set in...the fear that this is their one big break, their one shot at making millions and living the American Dream...that if they miss this chance they will be stuck in their workaday lives forever. They begin to put disproportionate amounts of energy and emotion into pulling off the presentation of their lives, at the expense of family, life and their overall sanity. This is the reason I dogged Staples so hard in an earlier post for treating potential finalists so cavalierly. Trust me on this. I can't tell you the amount of time I spent whittling and sanding non-functioning prototypes out of high-density foam and soft wood. Or the sleepless nights before my finalist presentation memorizing and agonizing over every word. Or the hours I would spend calculating how many of my products I thought Staples would need to sell to make me my first million. It consumed two months of my life. Here's the result: About $3,000 in prize money after taxes. A human interest spot on Fox News Chicago which generated zero additional interest. A human interest piece in a local suburban paper which generated zero additional interest. This blog is the only remaining vestige of my experience, is the most likely to result in postive long-term benefit, and ironically I wouldn't be writing it if Staples had picked up my product because I would be too afraid to jeopardize my "one big break". So where does this fear come from? My pop psychology background ;) tells me its a combination of the drudgery and dissatisfaction with the typical American work environment, and a by-product of reality TV, where ordinary people seem to be able to walk away with millions of dollars by taking advantage of their one big opportunity. Don't believe me? Check out this research from the UK which found that 16 percent of teens thought their success was most likely to come from celebrity like that found on reality TV. And you can't tell me a portion of the millions of adults embittered by the realities of working life aren't thinking the same thing. Here's the reality of it all: There is a ton of room for innovators large and small to make a difference in everyday lives through creativity and hard work. But the number of people who find both immediate and lasting success through these "big break" opportunities (even among the winners) is pretty small. More people win the lottery or play professional sports than find lasting success from a one-shot, one-winner invention competition or reality TV show or that one big sales pitch. Like most fears, the "Fear of the Missed Big Break" is based on some perceived reality, not reality itself. My point is not to discourage you from looking for these opportunities - not at all - but rather to encourage you to chase them down without the "Fear of the Missed Big Opportunity" haunting your every step. Like Evey and the oppressive government she was fighting against, don't give the powers-that-be the power to take anything from you. They have an agenda that they will see through to fruition. If you don't fit the agenda, you won't get your "big break", and no amount of preparation will change that. But that doesn't lessen the value of your idea. If you let the fear get the best of you, you'll obsess over every detail at the expense of looking for and exploring other opportunities to unleash your idea on the world. Be thorough, be smart and be savvy, but be fearlessly true to yourself and your idea. If you want inspiration, pick up a great magazine like Business 2.0 , or watch The Big Idea with Donny Deutsch . You'll hear stories about average (and yet hopelessly clever and creative) people who worked their butts off to make a good idea into a successful idea. And while you're at it, pick up a copy of V for Vendetta . It will serve you better than any book from the business aisle.